Dental caries is common in people with special needs. If the person is on prolong bottle-feeding, try to encourage drinking from a cup instead. If this is not possible, drink plain water frequently. If he/she is on sweetened medication, take sugar-free medicines if available and rinse with water after taking medicine. Practice good daily oral hygiene; either independently, if able to or assisted by the caregivers. Gum (periodontal) disease occurs more frequently in people with special needs. Commonly it is contributed by poor oral hygiene, damaging oral habits or inadequate oral hygiene measures. 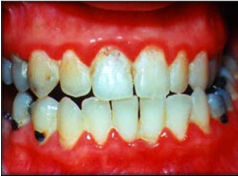 The gum appears red, swollen and bleeds easily on brushing. Some anticonvulsants, antihypertensives and immunosuppressants can also cause excessive gingival swelling. Conscientious daily oral hygiene is extremely important. 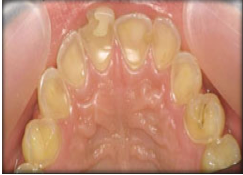 Malocclusion refers to a poor fit between the upper and lower teeth as well as crowding or malalignment of teeth. 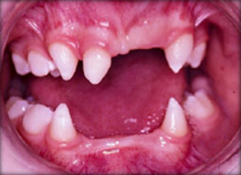 The usual presentations seen are flaring of upper front teeth, gagging of back teeth and anterior (front) open bite. These are caused by tongue thrusting or oral muscular imbalance in cerebral palsy. Teeth that are crowded are difficult to brush and floss leading to caries and gum disease. In addition to this, those with open bites tend to breathe through the mouth. Thus, the front teeth become dry and plaque sticks more easily leading to caries. When doing oral hygiene care, ensure that the upper front teeth are properly cleaned by lifting the upper lip and brushing the area. Orthodontic treatment may not be an option to many people with disabilities, but do bring them to the dentist for assessment on the feasibility of orthodontic treatment. Tooth anomalies are variations in size, shape and number of teeth. People with Down Syndrome, ectodermal dysplasia and other conditions may experience malformed teeth. Disturbances (very high fever, prolong illness, certain medications) during the formation stage of the teeth can lead to developmental defects. 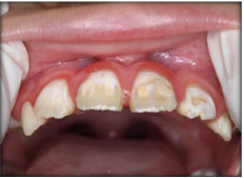 The defects appear as pits, discolourations or lines on the surface of the teeth. These defective surfaces are difficult to keep clean. 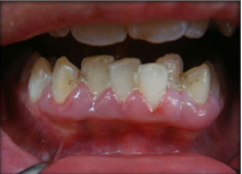 Developmental defects can be corrected with appropriate restorative work. Further restorative works may be required in the future. Thus ensure regular follow-ups to monitor oral health status and development of the craniofacial and dentition. Some people with special needs experience reflux of stomach acid into the oral cavity. The excess acid will erode the inside surface of the teeth and make them more sensitive. Rinse with water or water with baking soda to lessen the effect of the erosion. Use fluoridated toothpaste regularly. If unable to use toothpaste, fluoride gels or varnishes can be applied by the dentist during routine dental visits. Trauma to the face and mouth occur more frequently in people with intellectual disability, seizures, abnormal protective reflexes and poor muscle coordination. 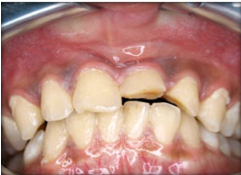 If the upper front teeth flares outward, the risk of fracturing the teeth if the patient fell, is higher. Traumas require immediate professional attention. Bring the person to the hospital immediately in the event of trauma. If there is any fractured teeth, if possible try to locate any missing pieces and bring to the clinic as well. 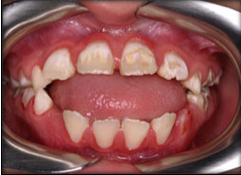 Bruxism or habitual grinding or clenching of teeth, is a common occurrence in people with cerebral palsy. This is due to poor coordination of the oral musculature. This habit cause flat biting surfaces of the teeth. Behaviour modifications may help to reduce, if not eliminate the habit. Sometimes a splint is recommended. Tell-Show-Do: The tell-show-do approach can help to reduce apprehensiveness of oral care. For example, before brushing a person’s teeth, tell the person what you are going to do. Show how it’s done. Sometimes it helps if the person holds the toothbrush while you hold his/her hand and demonstrate how the brushing is going to be done. Do the steps in the same way as that you have shown earlier. Give the person time to adjust to dental care. Rushing through the process will only make them confuse or even agitated. Give positive feedback (praises) to reinforce good behaviour. Have a routine for dental care. Practice it at the same place, same time and use the same technique every day. Familiarity with the routine will soothe any fears and make the procedures more acceptable. Position yourself where you can comfortably brush and see all the person’s teeth. Use a pea-sized fluoridated toothpaste if the person is able to rinse his mouth. If not, use non-fluoridated toothpaste instead or even just brush with water. Brush the front, back and top of every tooth, back and forth in short strokes. Angle the brush at the gumline and brush gently. Brush the tongue after you have brushed the teeth. Help the person rinse with plain water. If they can’t rinse, sweep the mouth with a finger wrapped in damp gauze. In certain circumstances, where toothpaste is unacceptable to the person, an attempt should be made to clean around the mouth with a piece of gauze or toothbrush moistened in an antimicrobial agent such as 0.2 % chlorhexidine gluconate solution. A toothbrush dipped in fluoride mouthrinse (0.05 sodium fluoride if used on a daily basis) can also be used effectively. Flossing cleans between the teeth where the toothbrush cannot reach. Many people with disabilities need caregivers to help them with flossing. Flossing needs some practice to get use to and the use of a floss holder may make it easier for some people. Fig. 12 The use of specially modified brush heads toothbrush or ‘Superbrush’ can be helpful. 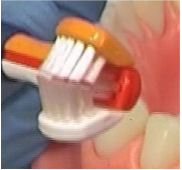 The brush consists of 3 sided bristles that cover the surfaces of the teeth in one motion. Regular dental appointments are very important for people with special needs. The dentist will be able to do professional cleaning for them. More importantly, regular examinations can identify problems before they cause unnecessary pain.